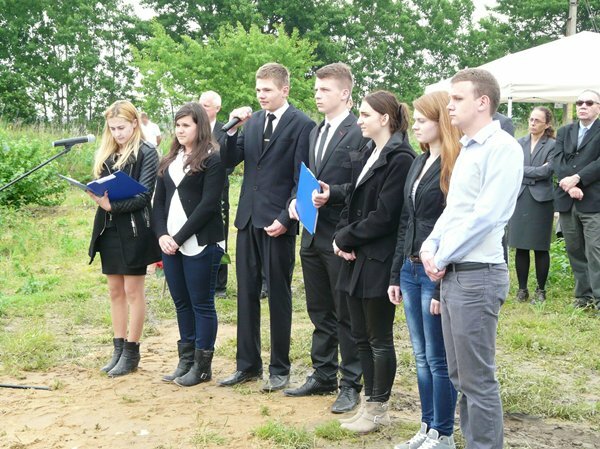 On May 26 in Klementowice the Lasting Memory Foundation initiated and performed a commemoration of approximately 350 Jews murdered by the German soldiers in June 1942. 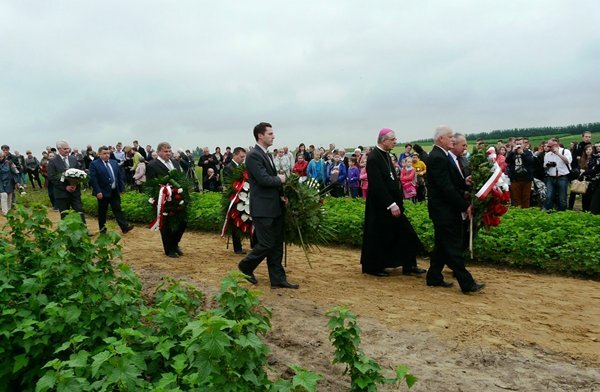 At the place of their execution and burial, we set up a memorial stone and held an unveiling ceremony which was attended by school youth, residents of Klementowice and neighboring villages, representatives of Embassies, clergy and local authorities. 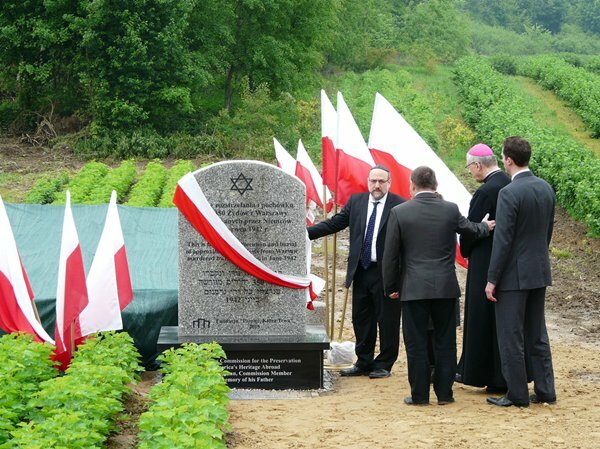 The ceremony in Klementowice was honored by the presence of the following guests: Ruth Cohen- Dar – Deputy Ambassador of Israel to Poland, Dru Alejandro – representative of the Embassy of the United States, Michael Schudrich – Chief Rabbi of Poland, Bishop Mieczysław Cisło, Waldemar Podsiadły – Voivode Representative, Michał Sobelman – Spokesperson of the Embassy of Israel, Zofia Kamionowska from the Children of the Holocaust Association, Stanisław Wójcicki – Mayor of Kurów, Stanisław Gołębiowski – Mayor of Końskowola, Mirosław Pustelnik – Chairman of the Końskowola Commune Council, Władysław Chabros – Chairman of the Kurów Commune Council, Paweł Krzywicki – Pastor of the Baptist Church in Puławy, Jarosław Bator – Pastor of the Methodist Church in Puławy, Zbigniew Fidut – Parish Priest of Klementowice, Zbigniew Turkowski – Principal of the Agricultural School Complex in Klementowice along with the students, children from the elementary school in Klementowice and the Volunteer Fire Department. 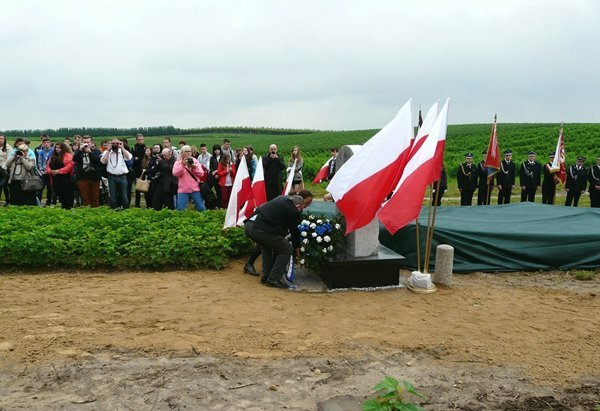 The ceremony was conducted by Zbigniew Niziński, President of the Lasting Memory Foundation. The ceremony began with singing the National Anthem of Poland. The participants were welcomed by the Mayor of Kurów Stanisław Wójcicki who also gave an introduction speech. He recalled a story of the events which had taken place there 73 years before –it was here, at the railway station in Klementowice, where in June 1942 the Germans transported in trains about 400 men from the Warsaw Ghetto, Polish citizens of Jewish origin, for them to work at railway construction site. They were detained in barracks in the land of the Agricultural School Complex in Klementowice. Physically weakened by hunger, they were unable to work. The Germans picked about 50 young men fit for work and decided to kill the rest. The victims were told to dig out their own grave, which they were unable to do. The grave pit was dug out on Saturday by an excavator working at railway construction. On Sunday morning, when there were no witnesses working on surrounding fields, the people were brought to the pit and executed. 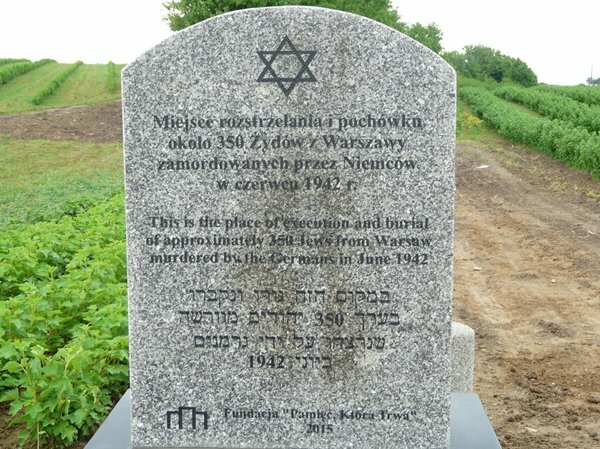 Until this day, the identity of the victims of this murder, committed by the officers of Nazi Germany, has not been established. After the Memorial had been unveiled, the clergy of different faiths prayed ecumenically: the Chief Rabbi of Poland Michael Schudrich, Mieczysław Cisło – Lublin Archdiocese Bishop, Paweł Krzywicki – Pastor of the Baptist Church in Puławy and Jarosław Bator – Pastor of the Methodist Church in Puławy. The Deputy Ambassador of Israel Ruth Cohen – Dar said that our duty is to make sure that evil does not return. Our participation in this ceremony is a proof that we are doing so. Bishop Mieczysław Cisło made an appeal in his speech – Every grave is a holy place for a Christian culture and we should preserve their memory. We should keep coming here with candles and flowers, so that for the world we are the sign of friendship and brotherhood, so that there is no more war or internecine fighting. Our concern should be that out of those commemorated places a new life of our relations could be born. The youth from the Agricultural School Complex recited poetry about the war victims. Flowers and wreaths were laid at the Memorial. The participants paid tribute to the dead. The commemoration of this place has been supported by Harley Lippman, member of the US Commission for the Preservation of America’s Heritage Abroad, whose more than 80 family members were killed during the Holocaust. The Foundation’s actions for commemorating the grave were also supported by The Town Office of Kurów and by individual donors.